My brother, Sumesh Barnwal, (age 20 years) was diagnosed with leukemia - blood cancer in Apollo Hospital Chennai in May,2016. 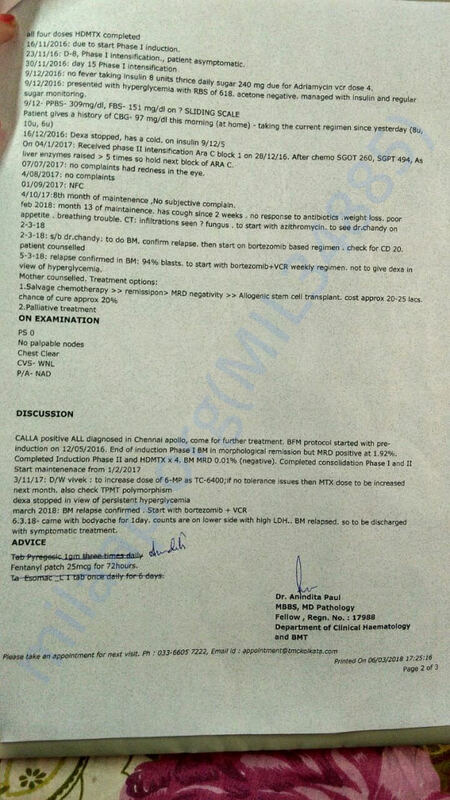 He had been admitted to Tata medical centre, Kolkata and the treatment (Chemo-therapies) went on for about one year. He was under constant supervision and recovered from the same in span of about one year. The doctor then released him and advised for monthly check-ups which was being done from then onward. Since then everything was under control till Jan,2018 check-up. On 28th Feb, he started feeling uneasy again and was suffering from body aches. He was in so much pain and high dose of pain killers were also not comforting him much. 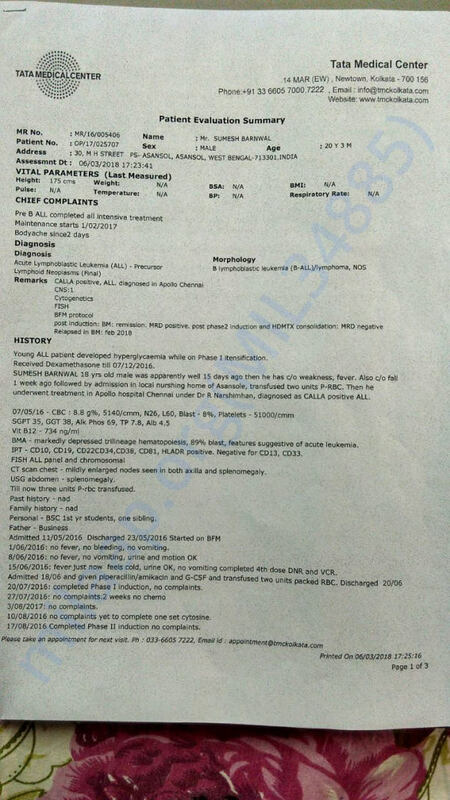 Then he again visited Tata Medical Centre, Kolkata and the doctor confirmed the relapse of cancer. His platelet counts were 17,000 (Normal count - 1,50,000) and the bone marrow failure was approximately 94%. This was quite shocking to us as he was doing fine until last month check up. 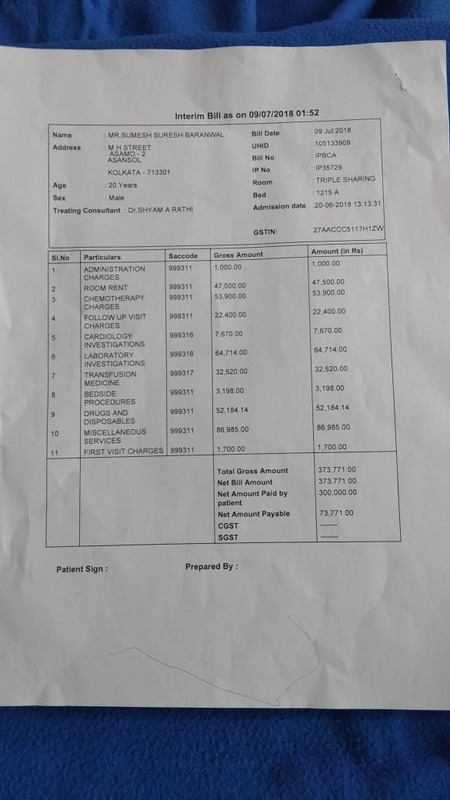 Now, he is again undergoing chemo therapy and needs a bone marrow transplant which will cost us nearly 12-15 lacs. (I will also attach exact figure once I get the written details from the doctor). We have admitted him in Shushrusha hospital, dadar, Mumbai under supervision of Dr. Shyam Rathi (Hematologist and Bone Marrow Transplant physician). My family is already doing their best to collect the money and has spent as much as they could afford in the treatment. We really need your help. It will be a blessing if you could kindly help us for the needs. My brother is very strong and he fights against all odds with a smile in face. With heavy hearts I want to convey that Sumesh is no more with us but his memories will always be there. After around one and half month of bone marrow transplantaion, suddenly his sugar level rose to 1200 and he became unconcious for two days. That time he was again admitted in the hospital. Day by day his health condition was deteoriating and one day doctor informed us that his kidney was also not working normally. His body became too weak and he was unable to sit for long and became bed ridden. After 20 days in the hospital he left us. He was in so much pain in his last days. My brother was very strong. Whenever I had asked him 'How are you Sumesh' he had always replied 'I am fine didi'. I don't know how he was bearing his pain. He was very jolly in nature and he definitely taught me to be strong. Nobody can fill his void and we will always miss him. At last I want to thank you all for helping my family in need. You all are very specials and I wish all of you a very healthy and happy life on behalf of my family. Here is a quick update on Sumesh's health. 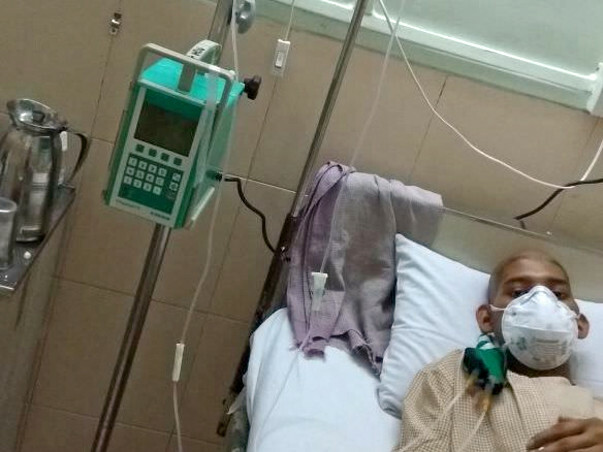 Sumesh was admitted again in the hospital as he was feeling too weak, doctors are saying for some time there will be fluctuation in his blood count for that they have prescribed medication. He will have to visit the hospital for regular check-ups so that doctors can track his health and change the dosage accordingly. Please pray for his speedy recovery. Thank you so much for the love and support. Sumesh has undergone Bone Marrow Transplantation on 26th June in Global Hospital, Mumbai. As Bone Marrow Transplantation is a critical process and it requires the patient to be very very careful from any kind of allergy and infection he is kept in an isolated room in the hospital under constant supervision since then. He will be discharged from the hospital in 2-3 days and will be visiting the hospital for next 2-3 months. To fully function the transplanted bone marrow within the body, nearly 5-6 months are needed and the changes occurring during these months will be monitored so the coming months are another challenge for us. However, We thank you for helping us in the treatment. We are still managing to arrange hospital bills and medicine bills and you can further help us financially or spiritually. I will keep posting updates on Sumesh's health in coming months. I am also attaching one of the bills from the Global Hospital.